I got some serious validation for putting more wood in the master bath in my post a couple of weeks ago. Jean Martha at Renovation Therapy suggested putting in some beams and while I love the idea. logistically (tall Guy, low ceilings) that isn't going to work. But it got me thinking that giving the ceiling the hardwood or bamboo treatment might be one way to go. Then I came across these great paneled bathtubs. 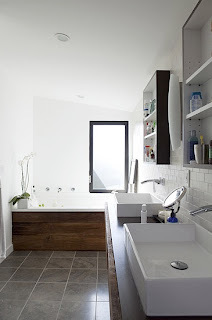 Straight walnut panels with inset lights would certainly help in our poorly lit master bathroom. This bath has a gorgeous redwood surround but overall it looks a little like the sample area of my local wood flooring showroom. 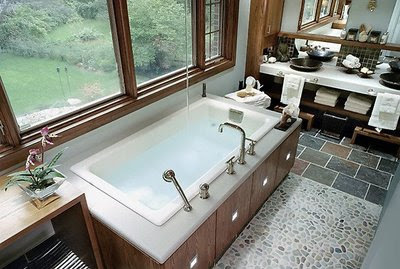 In any case I think I have a paneled bath, possibly with inset lights, in my future. What do you think? Gorgeous...LOVE the idea with the lights. Go for it! Your 1,000th post?! Holy cow! That's a major accomplishment, if you ask me. Congratulations! I think wood in a bathroom looks so warm and luxurious. These photos are beautiful. I love the idea (and the looks) of the recycled wood. Wow! 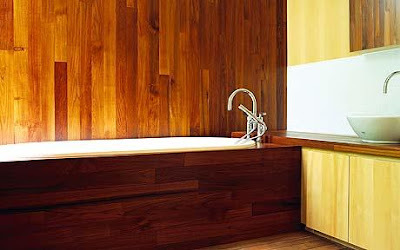 I never have thought of wood in the bathroom before but these images are fantastic, I'm a convert. Lol your comments on the last image. Thanks for visiting my Blue & Green post today! I'm with you about wood in bathroom. I've only seen it in mountain cabins, sometimes at the beach. Always rustic though not sleek like your pictures. I'm a big fan of interesting ceilings. You don't have to have !!!!BEAMS!!!! to bang heads on; you can just have beams. Wood certainly can be beautiful in a bathroom. Your pics certainly do show that. You just have to be careful not to overdo it. The one thing that I do want to point out here is to be careful when installing the wood to close to any water. If you are using wood with a high gloss poly you will be OK, but if you like the low gloss look, it is semi permeable and will stain if all excess water is not wiped up immediately. Keep it on the ceiling and even on the removable side panel, but not around the tub like in the picture. I'm ready to get out the liquid nails and glue some planks to my ugly builder stock tub. Congrats on the 1k post! Lovely idea. I really like the simplicity of the second photo. Not overdone but done nicely.